Spring is here and the greens at the farmer’s market are fantastic this time of year. We found some of the most beautiful baby kale and I made a light and flavorful ceasar salad with it. 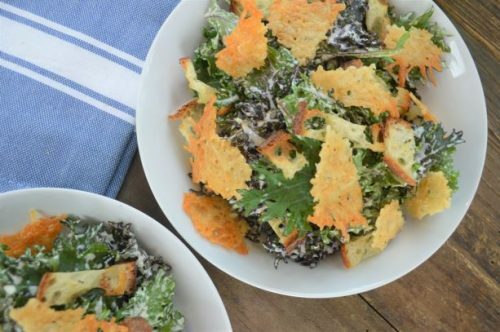 This caesar is great because it incorporates parmesan crisps, herb croutons and a creamy dressing with citrus and capers. The citrus and capers add the zest and savory umami that you miss when you omit anchovies. 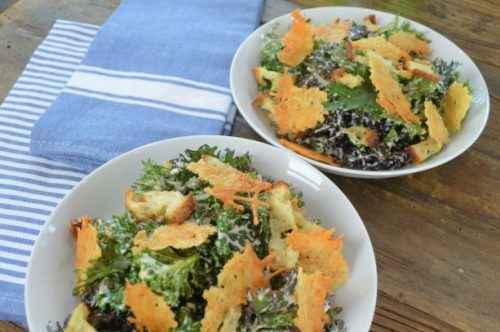 The parmesan crisps add texture and the simple but flavorful croutons round out this salad and make it a lovely lunch. Wash the kale and spin it dry. In a small bowl, toss the cubed sourdough in olive oil, herbs and salt and pepper. 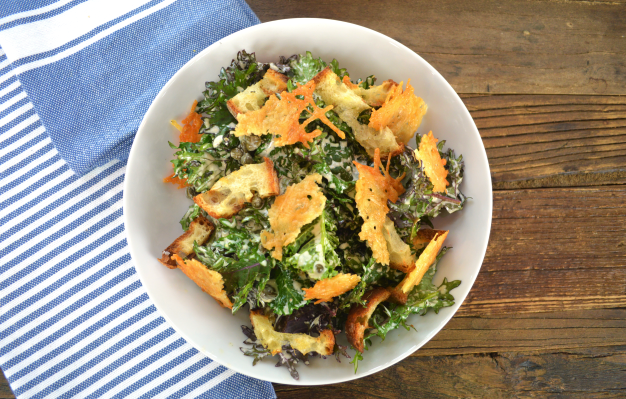 Spread the croutons on a baking sheet and toast them in the oven until they are golden brown. Place a sheet of parchment paper on another baking sheet. Make six mounds of shredded parmesan on the parchment paper and spread them out a bit. Bake the parmesan until the rounds have spread out and are crisp and browned. Cool the crisps on the counter. In a medium bowl, whisk together the olive oil, lemon juice, mayo, dijon, grated parmesan, capers and garlic. Add the kale and toss the greens in the dressing. Break the crisps into bite sized pieces. Divide the salad into six dishes and garnish them with croutons and crisps.